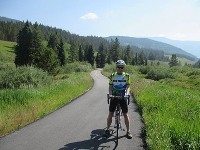 Timberline Adventures specializes in cycling and hiking trips throughout the United States and Canada. Challenge, discovery and fun are what define Timberline Adventures' trips. Our trip roster includes visits to 37 different national parks, including some of the wildest areas in North America, ( such as Glacier, Olympic, Yosemite, Acadia, Big Bend, Arches, and Volcanoes National Park). Our itineraries are more extensive than you will find at the generic giants. We have found the best routes and trails - the real gems - in our 35 years. And we've been recognized by National Geographic as one of the Best Adventure Companies on Earth, with trips named among their 50 Tours of a Lifetime. As a small company we focus on offering the best possible customer service. We think of our guides and guests as a community of friends. It's us you're talking to on the phone during the off-season, and it's us out there on the road and on the trail with you – whining with you in the headwinds and rain, and sharing the joy, exhilaration, camaraderie and sense of accomplishment that is part of every tour. We measure our success by the quality of your experience. Specialized Bikes on cycling tours.